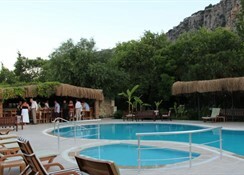 The Riverside Hotel is perched on the edge of the Dalyan River, between Istuzu Beach and Koycegiz Lake in the vacation paradise of Turkey. Only a five minute walk away from the picturesque harbour side town of Dalyan, this is a great hotel for couples and families with 33 comfortable guestrooms all with modern amenities. Guests to the Riverside Hotel can discover marvellous beaches, explore delightful villages nearby and experience real Turkish hospitality. 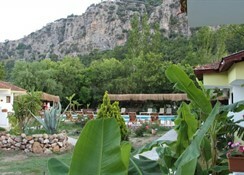 Dalaman Airport is 19 km from the hotel. Local Tips: Visit nearby Iztuzu beach, one of the worlds few remaining breeding grounds for Loggerhead (Caretta Caretta) turtles, and an area of astounding natural beauty. Please Note – Rates are exclusive to UK passport holders only. Food, drink and entertainment: The poolside bar and the al fresco restaurant are available 24 hours a day and boast a barbecue and traditional Turkish pizza oven. 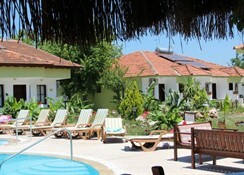 The menus include a wide selection of Turkish and international dishes. 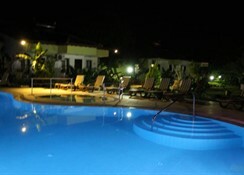 Sports, games and activities: One adult swimming pool and one children pool, both surrounded by a large sun terrace with sun beds, parasols, and a couple of hammocks. There is a private jetty overlooking the river with stunning mountain views. The hotel offers beauty & holistic therapies. 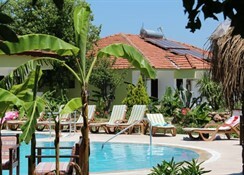 Additional: 24-hour reception, friendly owners Yucel and Metin ready to assist with any requirements, wireless internet connection available. The Riverside Hotel features 33 rooms with air conditioning (extra charge), phone, safety boxes, private showers/WC, and balconies.